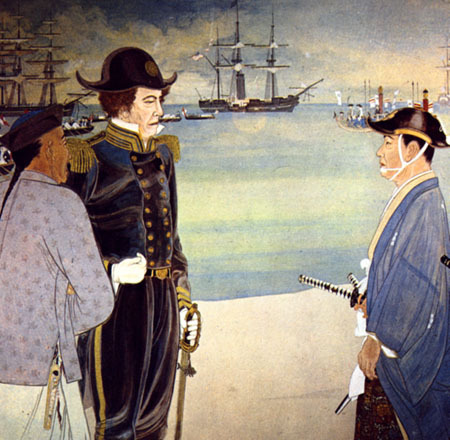 This report will focus on the changes that occurred in people's lives after Commodore Perry opened Japan to the outside world in 1854. From that point on, the country quickly shifted from an antiquated feudal society to one that looked forward with hope and expectation. In the Meiji Era, people's lives took a dramatic change in several areas. However, there were many ways in which traditionalism was still retained by the people especially in the countryside. By the end of the Meiji era, a new Japanese culture had started to arise as a synthesis of the rapid modernization and traditional culture. 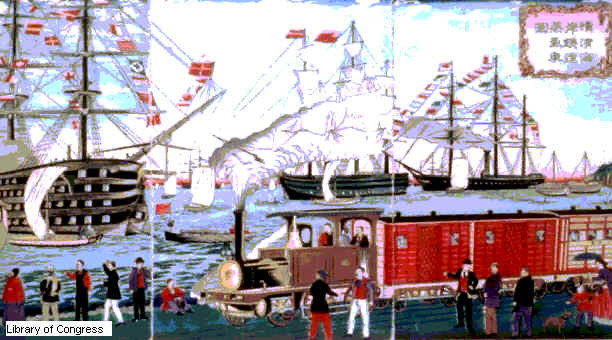 After centuries of isolation and several unsuccessful attempts by the Western nations at opening Japan to international relations and trade, the United States Navy sent Commodore C. Perry in 1853 with a letter from President Millard Fillmore to the Emperor of Japan asking for trade relations, care for shipwrecked sailors, and a place to store coal for steam ships. On July 8, 1853, the "black ships of evil mein" billowing smoke and riding without oar or sail were first seen off of Edo harbor (Walworth, 3). The mission was to be the defining point at the end of the feudal period and the beginning of the new age. In the words of the Emperor's reply to the President the following spring, "we are governed by imperative necessity." Japan could no longer isolate itself from the rest of the world. Under the Meiji Emperor the old feudal systems were dismantled and the nation looked toward the West for a new ideal. In order to consolidate power the new government abolished the han in 1871 and re-divided the country into prefectures. The government dismantled the samurai class by raising its own conscripted national army where commoner and samurai fought side by side and by outlawing the carrying of swords in 1876. Commoners were now allowed to take a surname and were free from any labor or travel restrictions. Although not without its problems, the Meiji Era was remembered as one of hope and discovery; the source of both was the endless menagerie of all things Western. During the Meiji period (1868-1912), the influx of new ideas and technology had a sweeping impact on all areas of Japanese life. At the same time, Japan still tried to hold onto its own cultural identity. In the end a synthesis of the old and new would bring about modern Japan. Industrialization and trade had a huge effect on the people's normal everyday lives. For instance, once sake became an industry it took on a much different place in society. Whereas sake used to be primarily home-brewed and saved for special occasion, industrialization had improved both the quality and quantity giving rise to the local tavern and along with it many of the social ills accompanying alcohol. Beer also made an introduction into Japanese life with advertising starting as early as 1872. However alcohol abuse soon led to consumption laws outlawing sales to minors in 1922 (Yamagida, p.41). Tea also had changed in this new era. It was during this time that Japanese started the enormous consumption of tea. No longer reserved for tea ceremonies or special times, tea became a staple of Japanese life (Yamagida. p 44). Along with the explosion in tea came an even bigger sensation in sugar. Previously very expensive, with the newly opened ports sweets of all kinds started appearing in shops in the cities. Sugar became so popular it had to be rationed and only then was it spread into the countryside. Before 1853 Japan was not only closed to the outside world, but within the country, even individual fiefs were isolated from eachother. As such if one region suffered from a poor harvest or natural disaster, the effect would be devastating, costing many thousands of lives a year. (Shibusawa, 57) But with the breaking of the feudal barriers both internal and external, the rural food supply could finally be stabilized. Being able to import rice, which only then became a staple of the Japanese diet, bolstered supplies even more. Consumption of rice steadily increased, especially in the cities, and by 1882 rice had become Japan’s main export. The opening of the foreign market had made production profitable, and this in turn helped to stabilize the price at home. In all these different areas, and throughout Japanese civilization at this time people found themselves inundated with ideas and technology and experiences that would have been only fantasy a generation before. In each case, they found ways to apply new styles, technology, and ideas to their pre-existing circumstances and to make something new come from it. Japan was able to adapt with so ferociously and completely because it did not want to be left behind in the world it had just re-entered. The changes that took place in the Meiji Era are important because it sets the stage for Japan’s rise as a world power. It is amazing to see just how quickly the Japanese society could transform itself from a feudal and isolationist island into an industrialized, modern nation in so short of a time. Like most sweeping cultural changes it was easier for the young to shift their attitudes. Meiji Japan was no exception, it was the former samurai who gave up the militaristic life for the role of the official, and the young peasant who went to the city or was conscripted into the army who was quickly exposed to a quickly evolving culture. It was the young who would pass on to their villages what was new and exiting. It was also this young generation which would see Japan's place among the world powers. With a total devotion to the Emperor, and increasing trends of militarism and industrialization, it would only be a short time until Japan found itself squaring off against adversaries who had only a few years ago viewed it as primitive and backwards. Yamagida, Kunio. Japanese Manners and Customs in the Meiji Era. Tokyo: Tokyo Bunko, 1969. Shibusawa, Keizo. Japanese Life and Culture in the Meiji Era. Tokyo: Tokyo Bunko, 1969. Walworth, Arthur. Black Ships off Japan. New York: Alfred A. Koff Co. 1946. Fujii, Jintaro. 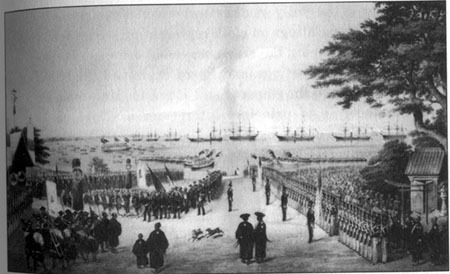 Outline of Japanese History in the Meiji Era. Tokyo: Tokyo Bunko, 1969.
http://www.indiana.edu/~japan/ A link to Indiana University which has many links to digests and journals of US-Japanese topics. http://www.us-japan.org/EdoMatsu/ A virtual tour of Edo. http://www.let.leidenuniv.nl/history/econgs/japan.html Articles about Japan's economic history.